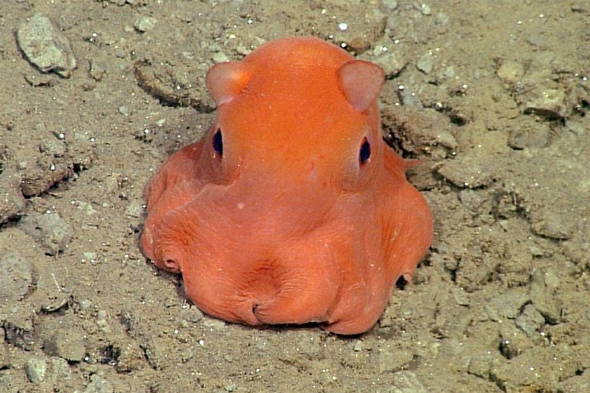 A tiny, pink octopus might be named adorabilis by scientists because of its cute appearance. The creature, which was discovered in 1990, is from the genus Opisthoteuthis, the same group as the flapjack octopus. Stephanie Bush of the Monterey Bay Aquarium Research Institute told Smh.com.au: "New species are discovered every year, not all of them get described, it can take a lot of time, years sometimes." She added: "I don't see any obvious reason why it would be inappropriate." "It's easy to pronounce and popular with the public." According to ABC, other species that have been deemed adorable include Lophornis adorabilis, the white-crested coquette hummingbird. Researchers do not know much about the octopus species, apart from it living in deep cold waters. The 12 individuals that have been studied have so far all been female. Dr Bush said she is trying to incubate a batch of octopus eggs in her laboratory but says they may not hatch for two or three years because the cold temperature of the deep ocean causes them to develop slowly. Last year, scientists discovered the deepest swimming fish ever recorded. The translucent white fish had wing-like fins and a tail resembling that of an eel. An international team of researchers took part in an expedition to Mariana Trench, the deepest part of the world's oceans, and discovered the never-before-seen species, thought to be a snailfish more than five miles below sea level. The weird-looking creature was found 8,145m beneath the waves. Several other new species were discovered on the trip. Dr Alan Jamieson, from Oceanlab at the University of Aberdeen, said: "We think it is a snailfish, but it's so weird-looking; it's up in the air in terms of what it is. "It is unbelievably fragile, and when it swims, it looks like it has wet tissue paper floating behind it." Where can I find one? These endangered nocturnal primates are typcially found in the eastern rainforests of Madagascar. They're also known to hang out on the island of Nosy Mangabe, on the country's eastern coast. Tell me a secret: According to legend, the aye-aye is an evil omen. It's so feared by the people of Madagascar that it is still often killed on sight. Where can I find one? Alpaca are kept in herds for their wool on the level heights of the Andes of southern Peru, northern Bolivia, Ecuador and northern Chile. Tell me a secret: Alpaca spit at each other (and humans) when they're cross. Where can I see one? Sometimes referred to as a sea cow, the dugong lives in the shallow coastal waters of northern Australia, where they can live for up to 70 years. Tell me a secret: Although an acquatic mammal, the dugong is actually more closely related to the elephant than the whale or dolphin. Where can I find one? This primate lives in southwest Amazon Basin, north Bolivia, west Brazil and Peru. Tell me a secret: The emperor tamarin allegedly got its name because of its similarity in appearance to the German emperor, Wilhelm II. Where can I find one? The flightless kiwi bird can only be found in New Zealand. It's semi-nocturnal and very shy - so very few New Zealanders have seen their national bird in the wild. Tell me a secret: Despite its awkward appearance, a kiwi can outrun a human. Where can I find one? The probiscis monkey is found exclusively on the island of Borneo in south east Asia, primarily in mango swamps. Their long noses are thought to attract females. Tell me a secret: The probiscis monkey is an expert swimmer and has the longest nose out of all primates. Where can I find one? Along the southern and western coasts of Australia. Leafy sea dragons have become endangered through pollution and are now a protected species. Tell me a secret: Because of their excellent camouflage, leafy sea dragons don't have any natural predators. Where can I find one? These strange-looking animals remain furless all their lives and live in parts of Sub-Saharan Africa. They are virtually blind but have acute hearing. Strange fact: Naked mole rats live in colonies led by one dominant rat (the queen). Like some insect species, the queen is the only naked mole rat female to breed and bear young. Where can I find one? The platypus is unique to Australia, inhabiting fresh water streams, rivers, lakes and farm dams. Tell me a secret: The male platypus has a venomous spur on the inside of each hind claw. The poison can kill a dingo and is said to be leave humans helpless for several weeks. Where can I find one? The soft-shelled turtle can be found in the waters of China and south east Asia as well as Russia. Tell me a secret: Using its long nostils, the Chinese soft-shelled turtle can snorkel in shallow water using its long nostrils. Where can I find one? The largest and heaviest lizards on earth, komodos are also the most lethal. They're native to Indonesia, and will eat anything, including deer, pigs, water buffalo and even humans. Their saliva teems with bacteria, so within 24 hours of being licked or bitten, most animals will die of blood poisoning. They are classified as an endangered species and protected under Indonesian law. Tell me a secret: Komodo dragons have lived for millions of years, but were only discovered by humans 100 years ago. Where can I see one? One of the world's smallest primates, the tarsier lives in the forests of Sumatra, Borneo and the Philippines. Tell me a secret: Tarsiers have the biggest eyes of any land mammal. In fact, their eyes are so large that they'd be the equivalent to the size of a grapefruit in a human being. Where can I see one? These nocturnal creatures are Australian egg-laying mammals who live in rainforests and deserts. Tell me a secret: An echidna can lift an object twice its weight. Where can I see one? You'll have to dive pretty deep - they inhabit the extreme depths off the coasts of Australia and Tasmania as well as Japan - but even if you did that you'd be very unlikely to see one as they're pretty rare, thanks to overfishing. Tell me a secret: The blobfish has no muscles - it floats above the sea bed as a gelatinous mass. Where can I see one? These distinctive tentacled underground mammals are native to north America. Tell me a secret: Star-nosed moles have 22 tentacles with more than 25,000 receptive organs - all in a space smaller than one square centimetre.